Now that I completed the short jacket that had been lying around in its nearly-finished state for seven years, I felt inspired to take on more UFO’s. I should admit that I am a slow sewer and always have a couple of works in progress lying around, but those are usually finished within a couple of weeks or months. As I seldom sew with deadlines in mind and my taste in clothes is fairly consistent I am fine with that. However, completely abandoning a project, stuffing it in a box and half-forgetting about it for years is a different thing. In the beginning of this year I decided to liberate myself from those half-finished items. Burdastyle 01/2011 #107 (source: Burdastyle.com). 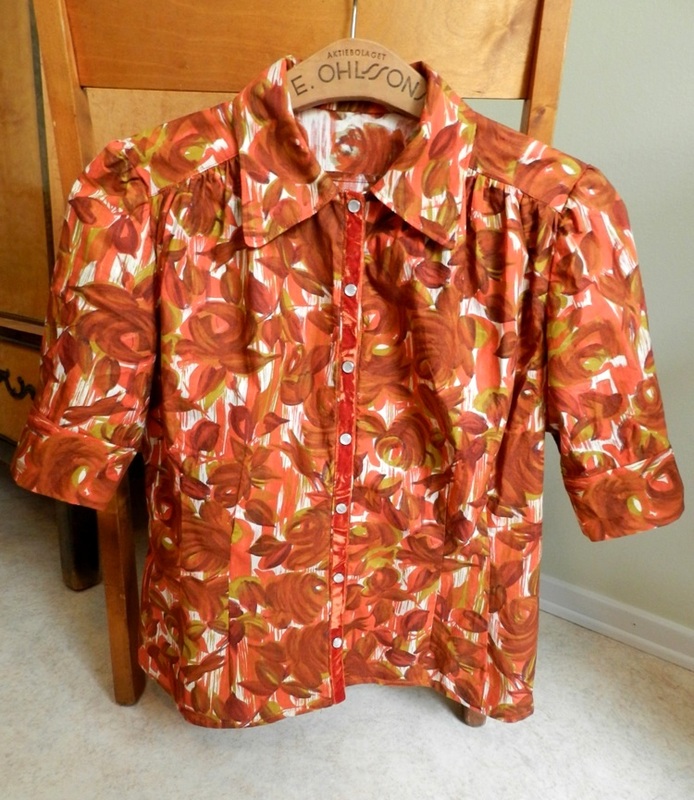 I do not recall when I started on this blouse, but it must have been over three years ago, possibly even four. 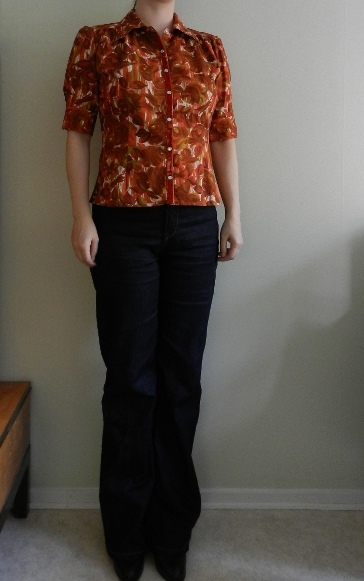 The pattern is the Three Quarter Sleeve Blouse #107. from Burda 01/2011. 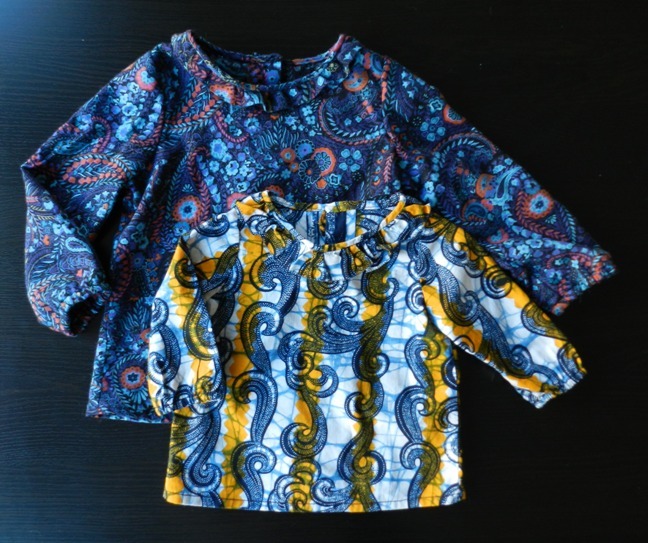 This – very fine – issue of Burdastyle also contains the pattern for the short sleeve blouse I wrote about two months ago. While I am still on the fence about that rather oddly-shaped garment, I consider today’s blouse to be a success, although it took me quite a while to get to that point. So what was it this time that delayed completion? Firstly, I messed up the first buttonhole and my attempts to fix it resulted in a large hole that needed covering up. I found some matching velvet ribbon but attaching it to the buttonband meant that I had to rip some seams, which I kept postponing. In another buttonhole-evading move I opted for faux mother of pearl press studs. Secondly, I had never made a sleeve vent before and I soon got lost trying to follow the instructions in the magazine. I then consulted my Knipmode handboek only to discover that the methods described in there were different from Burdastyle’s instructions. It took me quite some hours on the internet, as well as studying sleeve vents in shop-bought shirts before I felt ready to get back to tackle them. 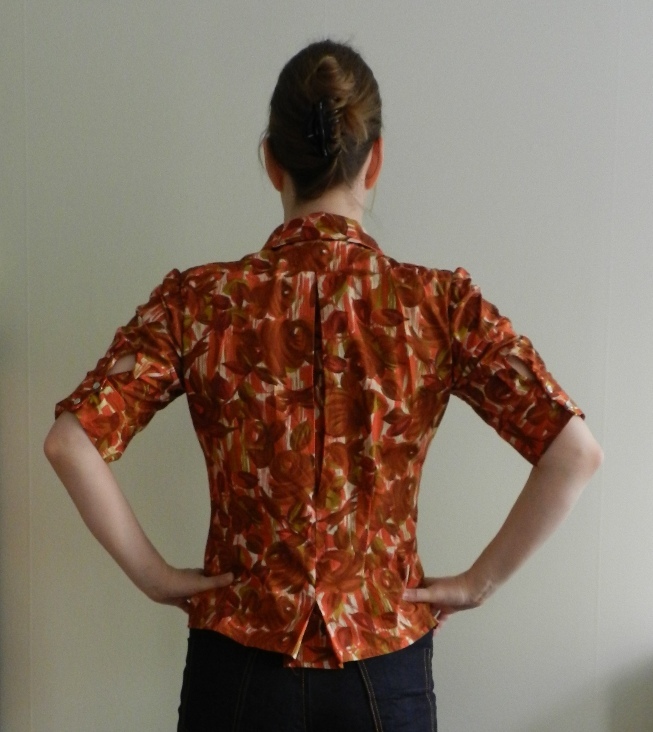 Once I set out to finish this blouse, I decided to redo the top stitching on the collar and the hem. Both the colour of the thread and the stitching itself did not look that great. I’ve ripped out so many stitches while constructing this blouse – sometimes even more than once – that I feel like I’ve sewn it three times. Frankly, I would probably have thrown it out if I hadn’t felt I had to make it work for the fabric’s sake. 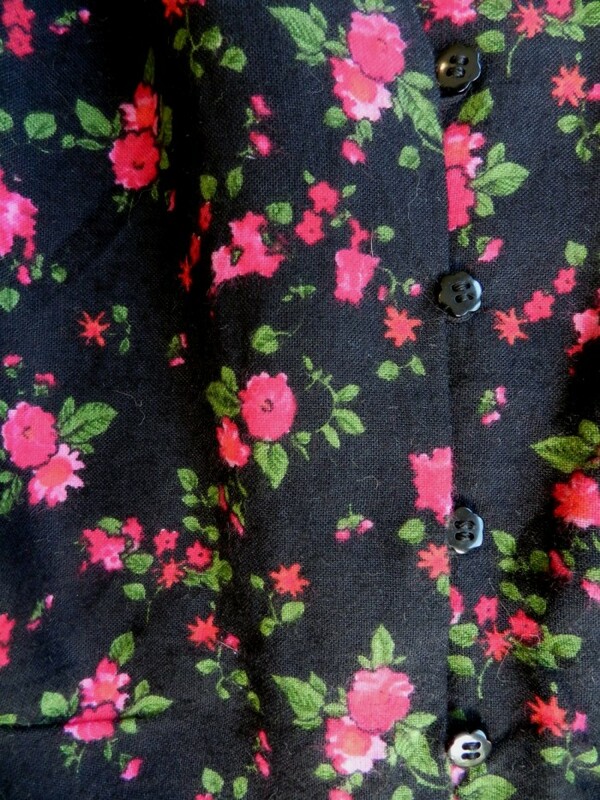 This fabric, another thrift store find, is one of my favorite fabrics of all time! 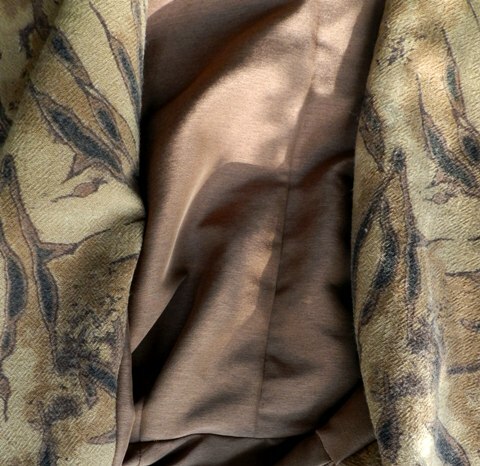 This picture shows the fabric best. The top stitching on the yoke and collar is barely noticeable, which is probably a good thing. I am very partial to these painterly floral patterns and in my opinion the rusty, autumnal palette of this one is close to perfect. The cotton is very crisp and makes a pleasant sound when handled. Needless to say, it was easy to sew. Fortunately, the fabric distracts from the many small cosmetic flaws that are hopefully only visible upon close inspection. 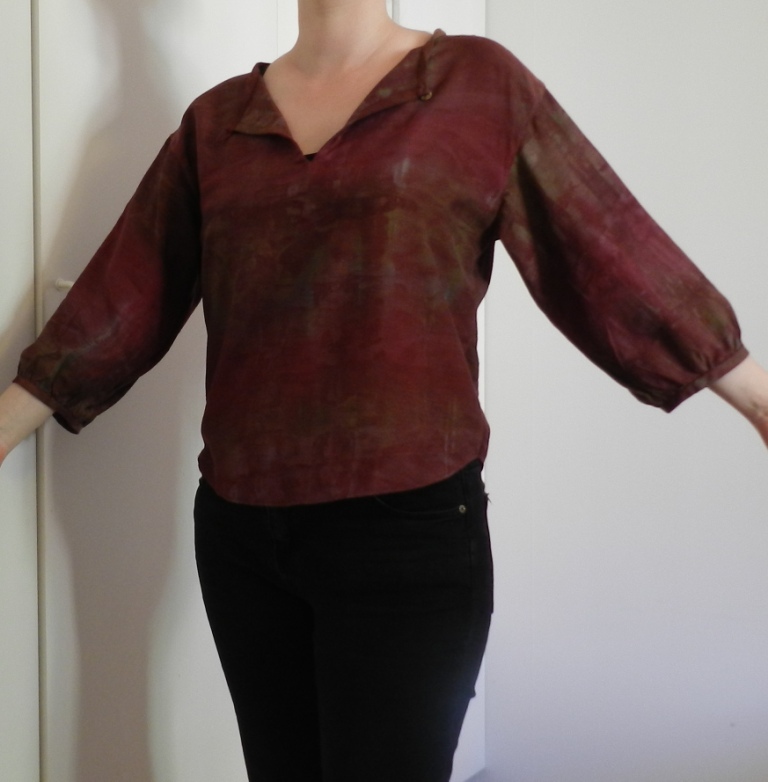 Next time I sew this blouse I will try to create some extra room around the bust by at least lowering the waist darts and redistributing the gathers below the yoke. I really like this pattern! The back pleat, yoke and gatherig provide a distinct forties silhouette and both the gathering and the pleat allow for relatively easy fit adjustments. I sewed a size 40, which was my regular Burda size back in the day, and it still fits me post-baby, although it is definitely more tight around the bust than it was before. The only modification I made this time around was to lower the part of the back pleat that is sewn shut, but in the future I will tweak the fit a bit more. Stil 2494. 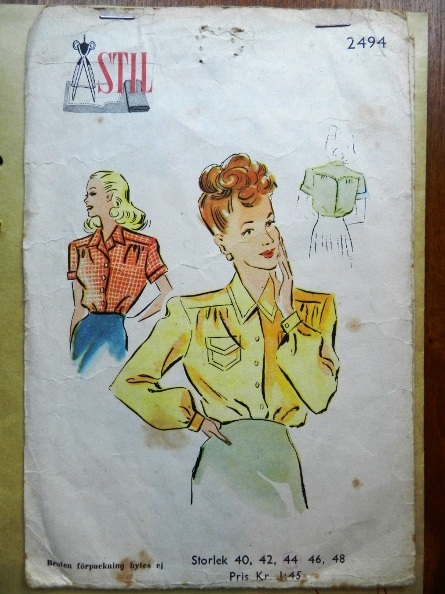 An authentic 40s blouse pattern. Spot the differences! 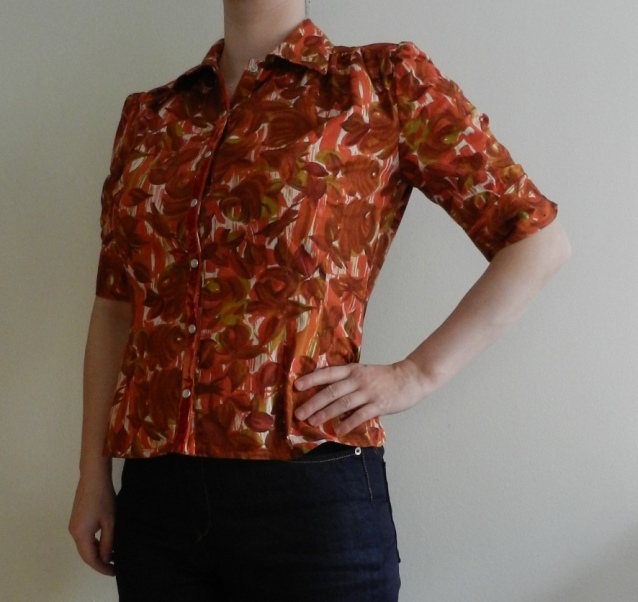 In the meantime I also managed to get my hands on a vintage blouse pattern in more or less the right size. 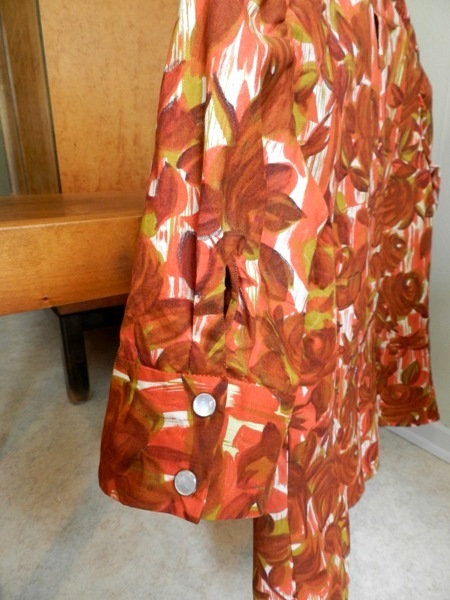 It would be fun to sew this one up as well some time soon and compare the fit of the authentic 40s pattern to Burda’s recent interpretation. Anyway, now that I no longer feel intimidated by sleeve vents I am ready to sew more blouses! 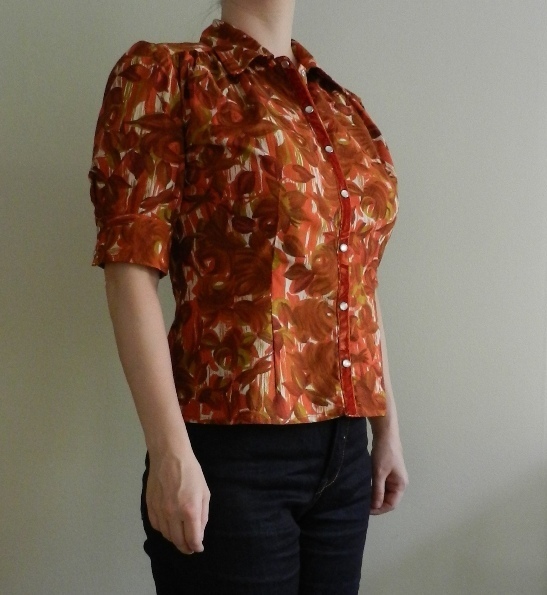 I completed this blouse just in time for it to be too cold to wear it for real, but at least I will have something nice to wear next spring! 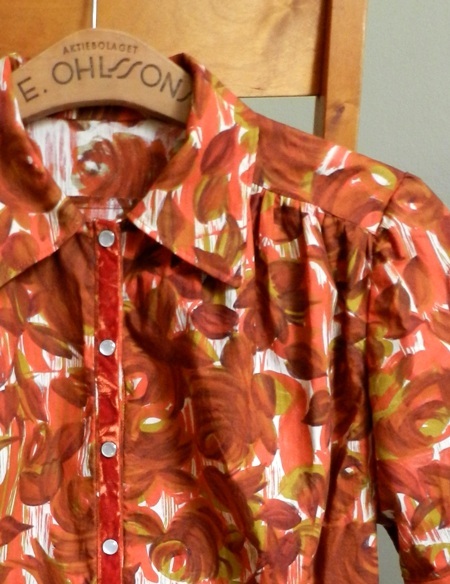 Really, really lovely blouse! The blend of decade elements partnered with a classic autumnal colour palette is head turningly pretty. Thank you very much, Jessica! 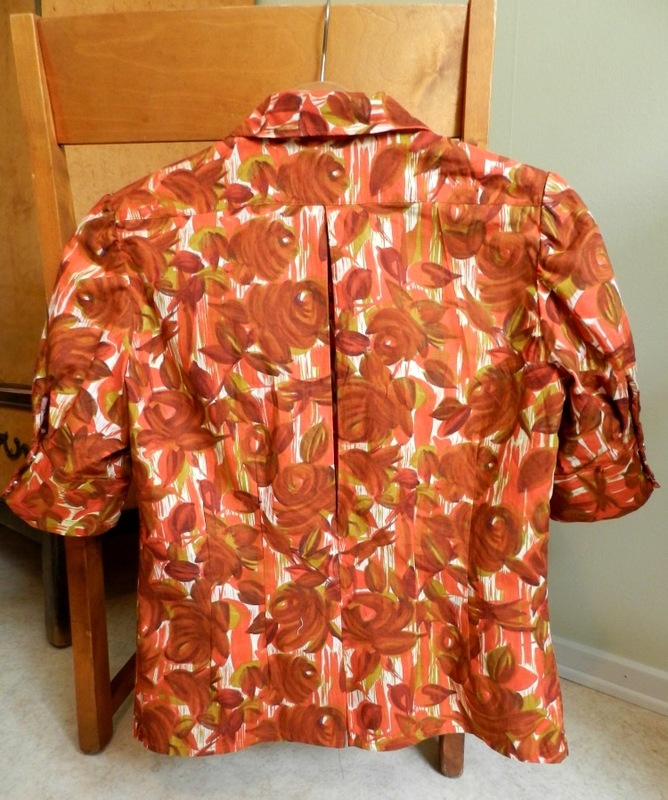 I am really looking forward to spring, so I can finally wear my blouse. I love the print. I love the style. 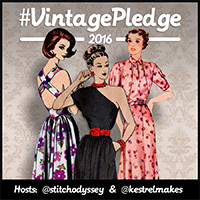 I love the accidental velvet edge save! I might have to give this pattern a try. Nice to find your posts and meet you. 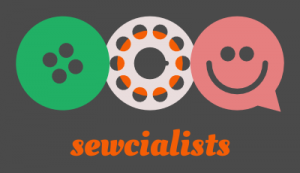 I think we like similar ways of sewing. Thank you so much! I somehow missed your comment, but it is nice meeting you too, checking out your website now!